Is the Holy Spirit Found Only in the Word Today? Ephesians 3:17 says “That Christ may dwell in your hearts by faith….” Scripture says Christ dwells in our hearts and then tells us HOW He dwells in our hearts, “by faith.” The Holy Spirit dwells in a Christian the same way as Christ dwells in a Christian – by faith. The Bible says that faith comes by hearing the Word of God in Romans 10:17. This logical argument depends upon several assumptions: first, that Christ dwells in a believer’s heart ONLY by faith; that the Holy Spirit dwells in a Christian the same way as Christ dwells in a Christian (unsubstantiated with scripture); that faith ONLY comes by hearing the Word of God; that these two passages were written with textual, contextual or subtextual purpose of establishing that the Holy Spirit dwells in the believer only in the form of the word or bodily; that this logical argument outweighs any other clear scripture (usually ignored, but sometimes explained away) which implies otherwise. That’s a lot of assumptions. If any fail, the logical argument falters as well. Ephesians 3:17 is immediately surrounded by this context: “I pray that out of his glorious riches he may strengthen you with power through his Spirit in your inner being, so that Christ may dwell in your hearts through faith. And I pray that you, being rooted and established in love, may have power, together with all the Lord’s holy people, to grasp how wide and long and high and deep is the love of Christ, and to know this love that surpasses knowledge—that you may be filled to the measure of all the fullness of God.” So it is surrounded by a prayer for the Spirit’s power in your inner being with no mention whatsoever of written scripture, which establishes a bodily surround for the Spirit. Neither passage establishes that it is directly related to the other by any key word or phrase or concept. Neither deals with the focus of the subject matter of the other. Neither establishes, on its own or together, that Christ or the Holy Spirit exists in the believer ONLY by faith (one would have to consider Saul’s experiences in 1 Samuel 10 and 19, certainly, before concluding that – neither mentions a prerequisite of faith on his part). Neither establishes, on its own or together, that faith comes only by hearing (and one would have to ponder about faith being given as a direct gift of the Holy Spirit per 1 Corinthians 12:7-11 before concluding that, especially verse 9). The second passage has no reference to the Holy Spirit; the subject simply isn’t in view. How could a conclusion drawn from it specifically apply to Him, especially if the context of the other scripture contradicts the conclusion? The other passages “explained away” by this logical argument speak clearly and explicitly to the Holy Spirit dwelling within the believer: John 14:16-17; Romans 8:11; 1 Corinthians 6:19; 1 John 3:24. That is their subject and and at least part of their purpose in being written: to describe the way the Holy Spirit – a Person – truly “lives,” not figuratively but literally – in the heart of the welcoming believer. Most of the supporting assumptions in this logical argument fail. When you knock the supporting legs off of a milkstool, it don’t stand up no more – and this argument is no different. ← Does the Holy Spirit Live Within the Believer? Keith, I believe your side of the discussion (I prefer to call it a discussion rather than argument) says we receive this “holy ghost ” at baptism, therefore Christians are privy to gifts,not given to others. Question: do you believe Jesus would give instruction on how to become like God, that run contrary to that belief, if he did not do the same as he asked us to do. I don’t believe God is reserved for “Christians only” either. I believe salvation is, but not the offer of salvation. I grew up in a church that taught the “word only” view of the Holy Spirit and believed that view myself for a while. I obviously have changed my view and think the “word only” view is a great example of what happens when scripture is read in both a reactionary mode to Charismatic theology and read in a theological vacuum. I think most of the people who still attend the church I was raised in have abandoned this view because they, like most Christians, realize it cannot be sustained in the light of all scripture. Rex, thanks for dropping in! I believe it’s an unsustainable doctrine, scripturally, but the truth opens doors to diffucult alternatives … and I haven’t really dared to go there yet. Keith, please explain to me, exactly, what this “Holy Spirit” is and how you see it acting in a christian. I have heard everything from “the spirit of Christ” to “the Spirit of God” , can you explain why it was not given to anyone except Jesus as long as he lived. if they are equal,(what are they equal in? it certianly is not authority) how can Jesus recieve the spirit from the father, then later give that spirit to his sons the apostles.? Then as you say, someone gave him to us , to do our bidding. I admit I don’t understand this at all, please help. You are asking the wrong fellow, Laymond. I don’t understand how the relationship among Father, Son and Holy Spirit works. I don’t understand how they can be three and still One. I just accept it. I accept what scripture says whether I fully or even partly understand it. Now we see as in a mirror, dimly; but then, face to face. I’m not in the business of telling God I won’t believe it until I understand it, in other words. It’s a bad business plan. I’m moving toward the business plan of “just do it” and I am asking God for help with that. If He wants to help me through His Holy Spirit, I’m fine with that. I think denying the promise of the power or presence of the Holy Spirit in the believer’s life is a bad business plan, because it tells God how He can or can’t work in my life. So I wrote these posts to do all I could to refute a bad business plan. Thanks for asking and for letting me get the talk out of my system. From where are you getting your teaching about the Holy Spirit? I know that there are a lot of books in the brotherhood that talk about the subject. Do you study the word of God before presented in the pulpit? or just thinking that where I open the bible I am going to start preaching? one time I read an old illustration about a Man who use to belive that the Holy Spirit guide him literally and wants to know more the bible. He decided that he would just open his Bible to a passage and whatever it stated, that is what he would do. He opened the Bible and read the section where Judas hanged himself. Turning to another passage he read “do thou likewise.” Finally , he read “that thou doest, do quickly.” Thinking that he was obeying the Word of God, he went out and hanged himself. In the fictitious illustration above, each passage was in the word of God. However by not carefully considering the context, a person committed suicide! He drew wrong conclusion by not considering the context.Likewise, it is possible for people today to draw something “from the Bible” that God never intended!! Christianity is a taught religion, as is all religion (Heb. 8:10-11, Matthew 28:20). We can not taugh wrong, and be right in our beliefs. The Bible therefore, It’s our guide in this world and final authority in matter of religion if we would be assured of faithfulness (James 1:25). No man can come to Christ for his salvation without being taught (John 6:44-45). I hope it’s clear that the source for what I’ve posted – the sole source – is scripture. Teaching from the scripture is the way teaching should be done … as long as the teacher does not go beyond what scripture says; adding words (like “only”) which aren’t there. I’ve heard several versions of the anecdote about twisting together unrelated scriptures, but this is the first one I’ve encountered that ended in suicide! As I’ve commented to J. Richardson on another post recently, anecdotes can be charming but prove nothing about how the Holy Spirit works through believers. Keith, can you at least tell me where to look to see this quote within the bible “three and still one” ? If it is there I would like to find it, if it is not there, then the thought enters my mind, that you believe the bible is insufficent for teaching. He also instructs baptism in the name of Father, Son and Holy Spirit (Matthew 28:19). Jesus speaks of the Spirit as both “Him” and “His” (John 14:16-17; John 16:15). The Spirit is described as that of Jesus (Acts 16:7; Philippians 1:19) and of God (Ephesians 4:30; 1 Corinthians 3:16). There is only one Spirit (Ephesians 2:18; 4:4; Philippians 1:27). As you can see, it is not a single quote, but it is an inescapable conclusion: the three are spoken of as persons, yet one. It is of primary importance that we understand who (what) the Holy Spirit is. He is God,Deity, a divine Person, one of the Godhead (Acts 17:29) There is One God who consist on three distinct personalities: The Father, the Son, and the Holy Spirit ( Matt. 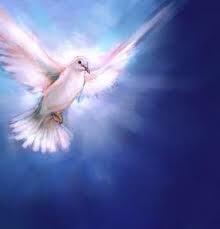 28:19; Acts 5:3-4), John 4:24; John1:1-3,14) The Holy Spirit is not a “force”, a “puff of wind” or an “it”. The Spirit inspired men to give to us the Holy Scriptures (II Tim. 3:16-17; II Pet. 1:21; John 16:7-13; I Cor. 2:10-13; Eph. 3:3-5; Acts 1:16, 2 Sam. 23:2). Thus, being perfectly given, the Bible is an all-sufficient Book for man’s salvation. (cf.II John 9; I Tess. 2:13; Gal. 1:8-9). Perry B. Cotham, conversion( A compilation of Sixteen tracts ( The Bible [God’s Inspired Book versus Direct Holy Spirit Guidence” ) 1814 Santa Cruz Grand Prairie, Texas . ) Pg. 291. 1. HIS WORKS PROCLAIM PERSONALITY. (1) He speaks. “But the Spirit saith expressly, that in later times some shall fall away from the faith” (1 Tim. 4:1). A speaker is a person; no influence or principle can speak. (2) He testifies. “But when the Comforter is come, whom I will send unto you from the Father, even the Spirit of truth, which proceedeth from the Father, he shall bear witness of me” (John 15: 26). (3) He teaches and quickens the mind. “But the Comforter, even the Holy Spirit, whom the Father will send in my name, he shall teach you all things, and bring to your remembrance all that I said unto you” (John 14:26). (4) He guides. “I have yet many things to say unto you, but ye can not bear them now. Howbeit when he, the Spirit of truth, is come, he shall guide you into all the truth” (John 16: 12, 13). (5) He leads and forbids. “And they went through the region of Phrygia and Galatia, having been forbidden of the Holy Spirit to speak the word in Asia; and when they were come over against Mysia, they assayed to go into Bithynia; and the Spirit of Jesus suffered them not” (Acts 16:6, 7). (6) He searches. “But unto us God revealed them through the Spirit: for the Spirit searcheth all things, yea, the deep things of God” (1 Cor. 2:10). In the above passages the Holy Spirit is said to speak, to testify, to quicken, to teach, to guide disciples, to lead, to forbid and to search. All these things unite in showing the Holy Spirit to be a person, for nothing but a person can do them. 2. HE HAS THE CHARACTERISTICS OF A PERSON. (1) Mind. “And he that searcheth the hearts knoweth what is the mind of the Spirit” (Rom. 8:27). (2) Knowledge. “Even so the things of God none knoweth, save the Spirit of God” (1 Cor. 2:11). (3) Affection. “Now I beseech you, brethren, by our Lord Jesus Christ, and by the love of the Spirit, that ye strive together with me in your prayers to God for me” (Rom. 15:30). (4) Will. “But all these worketh the one and the same Spirit, dividing to each one severally even as he will” (1 Cor. 12:11). (5) Goodness. “Thou gavest also thy good Spirit to instruct them” (Neh. 9:20). Goodness, will, affection, knowledge and mind are all characteristics of a person. By no stretch of the imagination can they be ascribed to a mere impersonal influence or principle. These five characteristics form the fingers in the hand of certainty by which we grasp the personality of the Holy Spirit. Jhn 5:36 But I have greater witness than [that] of John: for the works which the Father hath given me to finish, the same works that I do, bear witness of me, that the Father hath sent me. Jhn 5:37 And the Father himself, which hath sent me, hath borne witness of me. Ye have neither heard his voice at any time, nor seen his shape. Jhn 8:18 I am one that bear witness of myself, and the Father that sent me beareth witness of me. Laymod, Did you read carefully Jn 15:26? when you use the word “Whom” is not talking about somebody? sorry! laymond, When Jesus said: “Whom” Not you. Laymond, According to the Scriptures. How many witnesses do you need affirm a testimony is true? because that’s the whole point in Jn. 5:36. John came first giving testimony of Jesus as the true and God the Father. Matthew 18:16 “But if he will not hear, take with you one or two more, that ‘by the mouth of two or three witnesses every word may be established.” It was told in the law of moses (Deuteronomy 17:6). That they need to hear 2 or 3 witnesses to belive not “one”. When our Lord Jesus was baptize in Matthew 3:16-17 you can read the manifestation of the Godhead. and the testimony of the Father and Holy Spirit. another occasion when Jesus took Peter , James, and John his brother and the father gave testimony of Jesus and he told them: “This is My beloved Son, in whom I am well pleased. Hear Him!” (Matthew 17:1-5). Mar 16:14 ¶ Afterward he appeared unto the eleven as they sat at meat, and upbraided them with their unbelief and hardness of heart, because they believed not them which had seen him after he was risen. Keith, I don’t envy you one bit here. I don’t have much interest in debating such topics, and even less tolerance for those who are disagreeable about it. I’m thankful that God Himself resides in His church and in individual Christians, and look forward to the day when, following resurrection and judgment, the whole creation receives His manifest glory. And I’m NOT subscribing to follow-up comments! Mar 16:17 And these signs shall follow them that believe. Sounds more like a test of your faith, than a challenge to the Lord. you surely don’t believe the “Golden Serpent” was a test of God’s power, it was a test of the people’s faith. And Keith, you do have the patients of Job. as the bible says we should all be willing to discuss what we believe. Keith, you and I have proven that a discussion does not have to become “nasty” or fatal, as long as you use the sword Jesus gave us, God’s Word. And I still consider you as one of, or the most “godly man ” on the blogs. none of what I say is meant to be dispiteful, and I take none of yours in that manner. Mr. Gonnerman, I do not intend to start a conversation with you on this because I don’t know you. but Just a bit of advice, not from me. I don’t know of any debate, where both parties were not disagreeable. If there were no disagrement, there would be no debate. wouldn’t that be nice we could say anything we want with no challenge to the truth of it. Keith do we actually believe that God sent “another person” to earth to do as he would,as he willed, as “guest for truth” indicated. After reading what Jesus said, I just can’t bring myself to believe that. In this passage peter is giving the testimony (He was a witness) about the Godhead working the same purpose to save the mankind from their sins. A Good question to consider would be, to whom was God speaking in Gen. 1:26, when he said:” Let us make man? To whom was God talking? Was he just talking to himself? Were there no other persons to whom he could say, “Let us make man? It is obvious that he was not talking to man. There were no men! If the theory is true that there is only one person in the Godhead. To whom could God have been speaking when he said, “ Let us make man in our own image? In contrast with this passage in the new testament about us 1 Thessalonians 5:23 Now may the God of peace Himself sanctify you completely; and may your whole spirit, soul, and body be preserved blameless at the coming of our Lord Jesus Christ. Jhn 1:17 For the law was given by Moses, [but] grace and truth came by Jesus Christ. Jhn 17:8 For I have given unto them the words which thou gavest me; and they have received [them], and have known surely that I came out from thee, and they have believed that thou didst send me. Jhn 14:10 Believest thou not that I am in the Father, and the Father in me? the words that I speak unto you I speak not of myself: but the Father that dwelleth in me, he doeth the works. As I read and understand all this, Jesus brought the “spirit of truth” “God’s word” when he left he gave this same “spirit of truth” to the apostles so they could carry on God’s work, without flaw. No the “holy ghost is not a person,it is the holy word of God, “the spirit of truth” in-trusted first to Jesus then later to the apostles through the breath of Jesus. This “spirit of truth”/ the word of God was later in-trusted to the writings of the apostles, the bible. Laymond, The Holy Spirit is a person (invisible because is a spirit like God the father)nobody has seem God (1 Jn 4:12) but our lord Jesus has show us the father. The Holy Spirit is God too and the instrument that the Godhead use is his word because is the way we can understand humanly. Have you read the preposition (3) the Spirit dwell in the christian through the medium of the written word, His law (Romans 8:2) and by one’s obedience to that word. (1 Peter 1:23). As we see, from Genesis through Revelation, the power of God is his spoken word, whether he spoke through angels, the prophets, or through his son, and finally through Jesus’ apostles. In the beginning he, himself spoke to man, before the fall. Gen 3:9 ¶ And the LORD God called unto Adam, and said unto him, Where [art] thou? so we know God could talk to man if he so desired, but I believe it is said God does not associate with sin. so he has chosen to speak through others. In fact, the others that He gave His inspired Word to were also sinners. God, and His Spirit have always interacted with people in a literal way. So why would anyone maintain that all of a sudden He doesn’t anymore? Especially when He’s said that He would be with us? MM I do believe you mis-read what I said.I believe I said God had chosen to, not that he couldn’t, my whole point was, he could if he was so inclined. “God does not associate with sin. So he has chosen to speak through others.”. Laymond, your comment implied that it was because of man’s sin that God chooses not to speak to man anymore. But then you say He spoke through others. Who are those others, if not also men? I mean, I know you discount the inspiration of Paul’s writing, but do you honestly think that none of the writers of the Bible were given the Holy Spirit? No, Jesus was not sinful, He was perfect. But He promised to give His Spirit to men who were not perfect.